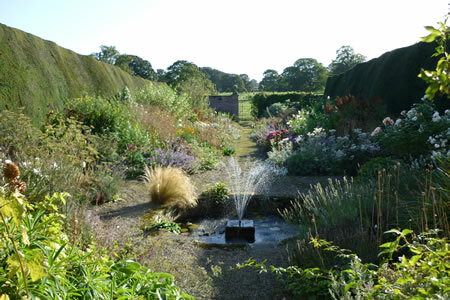 Located in the North Yorkshire countryside, near the cathedral city of Ripon, our beautiful 18th century walled garden can accommodate a wide range of events from wedding receptions to musical concerts and wonderful children's' parties. The garden enjoys an intimate and secluded situation, surrounded by woods and overlooking fine parklands. Norton Conyers's distinct air of mystery and romance are well known among book lovers; they provided the inspiration for one of our most touching love stories, Charlotte Bronte's 'Jane Eyre'. 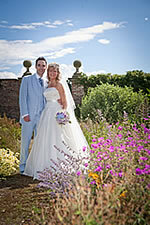 Your can entertain your guests in the garden's most picturesque feature, the 18th century Orangery. Southward-facing, hung with roses, with its ornamental pond and fountain before it, it commands a fine view of the ornamental iron gate and the parkland beyond. 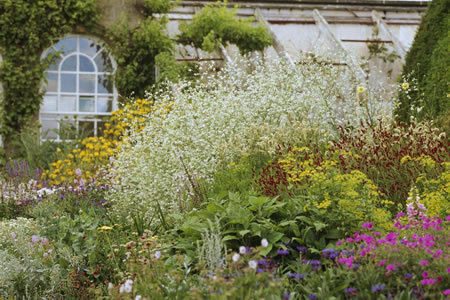 The paths are flanked by traditional herbaceous borders, together with gold and silver plants, old-fashioned peonies, irises and high yew hedges. Reminiscent of F.H Burnett's 'Secret Garden' in its variety and seclusion, it provides an excellent setting for children's parties and teddy bears' picnics, with ample lawns on which children can run about and play. The garden is also open to the public on various dates throughout the summer. Please see Facilities page for details. This website and its contents are Copyright© Norton Conyers 2011 - 2016. By using this site you acknowledge to respect our conditions regarding use of its content and images.